I have never been bodily present for a balloon release in memory of Skye, but earlier this year a balloon was released in her name and one of my child loss community friends graciously took pictures, which were beautiful. The picture I chose for today, however, represents a release of a different kind. 4 years ago today, we released the earthly body of our first and only child (at that time) into the ground. There was not much joy in that moment if there was any at all. Her short life had culminated in this, being placed into the cold earth in mid October, waiting for the frost and snow to wrap around it instead of our aching arms. The feeling that day, by the time we made it back to the grave site in late afternoon after they had covered her up, leaving a tiny mound filled with our hopes and dreams and fears, the feeling was complete devastation. There was nothing left to do, nowhere left to go, we simply had to begin carrying on after we left that tiny grave side. You may understand then why we were so reluctant to release her and we hovered around her grave, not many tears left to cry at the moment, just wanting to close our eyes and have it all be a horrible nightmare when we opened them again. I was 23 years old, my husband was 25. I felt far too young and yet, far too old at the same time. Nobody should have to bury their baby, but especially not when you are that young and full of life and hope and dreams for the future. We were just a couple of months shy of celebrating our second wedding anniversary, just weeks away from Thanksgiving and Christmas. Standing by that grave, holding onto that moment, it was as if we could keep it all from moving forward if we just kept standing there, looking down at the ground. We could just stop time, maybe not reverse it, but stop it right there. Of course, this was just a fancy, we couldn’t stand there forever, at some point we had to turn, walk away, and finally let her little body go. I snapped this picture just moments before the inevitable moment of release. 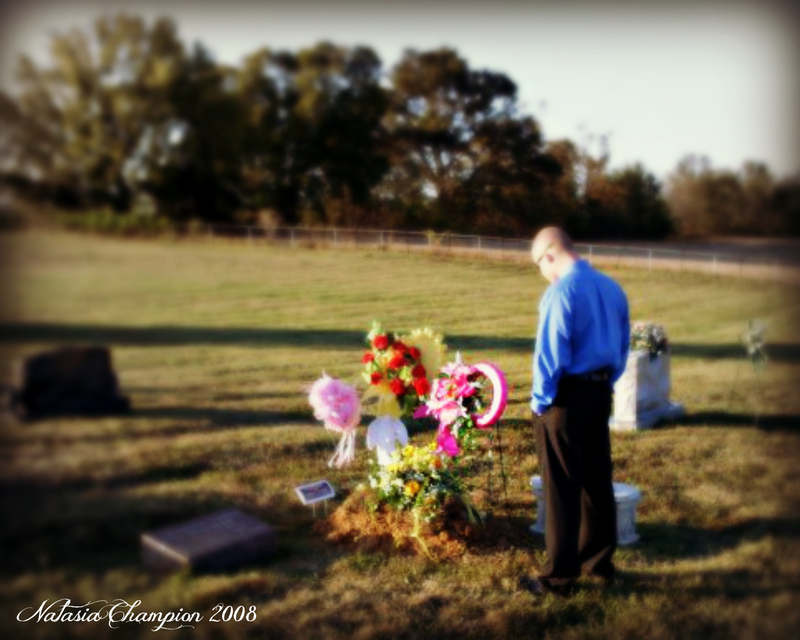 My husband Josh at Skye’s brand new grave on October 16,2008.